Up: That's a really good design idea, but I'm pretty sure it's too broken. 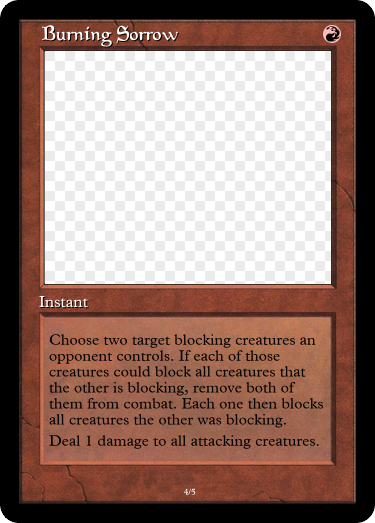 The ability to pay 4 to kill most things, and 5 to outright kill anything and put 3 +1/+1 counters on it makes the card too good in my opinion, even if you have to wait a turn by using the first ability. Also, I feel like these abilities work much better for gameplay at sorcery-speed, because otherwise combat is a mess. Overall, great idea, but costing should change if you want the card to be more fun. 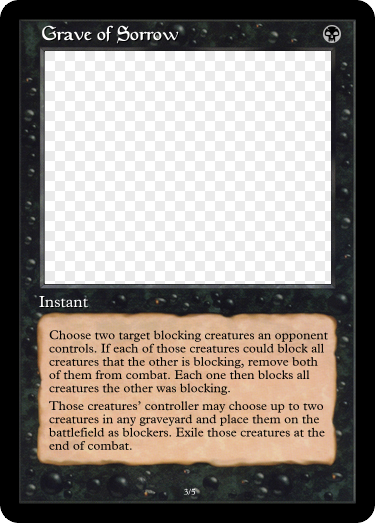 Next: either Timeshift or Alternate Eye of Storms - your call! All good points. I was thinking that 7 mana for the first -3/-3 and BBB for the destroy was balanced, but everything should definitely have been sorcery speed (except maybe the destroy, if I wanted it to be splashier). Whenever a creature dies, exile it. Whenever a player casts a creature spell, for each creature card exiled with ~, that player may create a token that is a copy of that card. Those tokens have haste. Exile them at end of turn. Up: I like how you're creating tokens and then exiling them so that, barring certain circumstances, people are just getting one turn worth of benefit still, but it works very well within its colors. Up: The only thing I would change was to make it a Golem Warrior. Up: Difficult to get there, but doable if you build around it. Or Jokulhaups. Good flavor too. 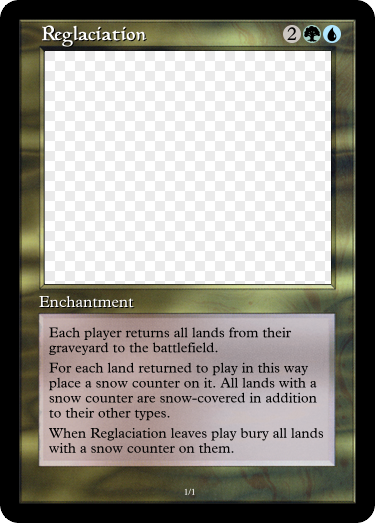 Whenever an opponent puts a land onto the battlefield, if they control more lands than each other player, you may search your library for a basic land card, put it onto the battlefield tapped, then shuffle your library. Up: Unusually I believe you could have kept the 4CMC casting cost for that card. Good alternate flavor etc. Sorry it's a little wordy. Up: I like the idea that the futureshift aspect is the ice age cycle, as well as the return of snow permanents. Up: Fun little shift with land hate. 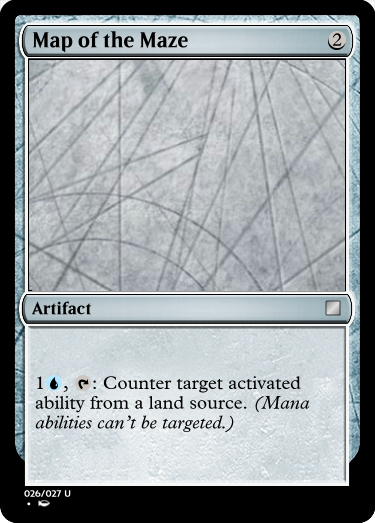 Given how powerful lands are these days, this would fit in well in most blue decks. 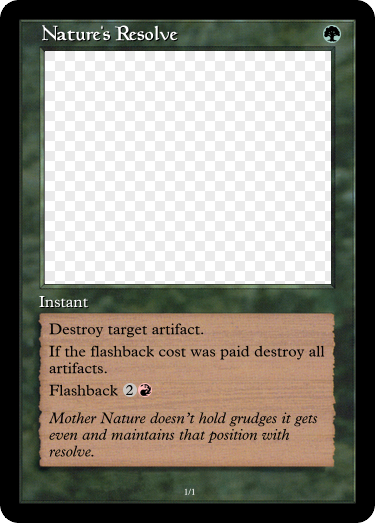 The only problem I see with this is that you need to make the reminder text correct and it will not deal 1 damage when tapped for mana (that is an inherent ability that comes from being a land - mountain). If you want to make the card work as you have listed it then it needs to be like this. Whenever Goblin Hideout becomes tapped it deals 1 damage to you. : Create a 1/1 red Goblin creature token. Personally I wouldn't add the reminder text as the card is already wordy. Other than that I like the flavor. Up: The reason I don’t like Planeshifting as part of this game is because it’s supposed to be the exact same card, just in another color. Your design was interesting, so I’m going to treat it like a Timeshift. That being said, Nature’s Resolve is very overpowered. 1G for destroying an artifact with an upside is the rate we get, but this flashback is too good an upside. 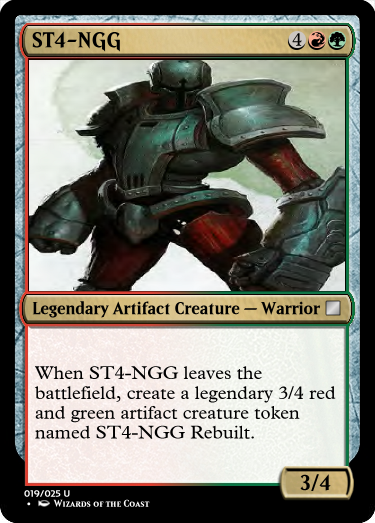 Shatterstorm is a sorcery for 4 and By Force is a sorcery that costs more for each artifact, but yours is 3 mana, at instant speed, to destroy all artifacts without spending a card. Your card as a sorcery, with flashback for 5 or 6, would be much more balanced. Draining Lightning deals 4 damage to target creature. When that creature dies this turn, add an amount of R equal to that creature’s converted mana cost. +1 to Planeshifting as it currently is not really being a good fit for the spirit of this game as unlike the other options you're locked into having the same effect (and it's kind of misleading - for a while I thought it was what Alternate actually is.) fluffydeathbringer - any chance we can get it slightly modified? Up: That ability is slightly undercosted, and to keep with the original card, I would have had the mana be added at the beginning of the next main phase. Probably a more powerful than the original, but it's in the colors. Also, I totally agree that planeshift is wonky right now. I try to avoid giving planeshift challenges, and don't usually consider taking them either. 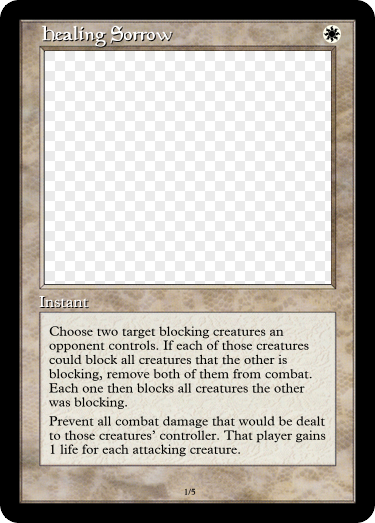 Card can be modified if it ultinately accomplishes the same effect. ([card]Blastoderm[/card], [card]Calciderm[/card]) If the card is UP/OP/super niche, you're allowed to rebalance or tweak it (e.g. Turning [card]Melting[/card] into a snow based [card]Cyrptolith Rite[/card]). Edit: Looks like card tags don't work on mobile, rip. Challenges have been updated in accordance with player feedback, as well as cleaned up in general. Take this into account henceforth. 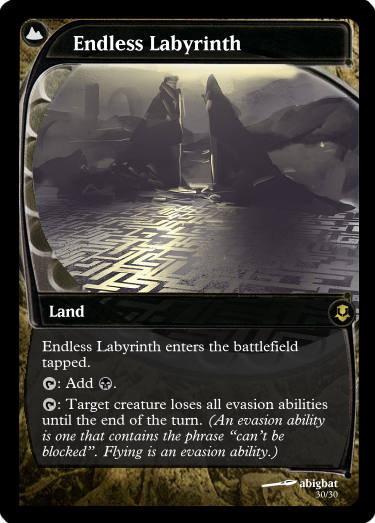 I really like the flavor you created, the naming is a little corny but I probably couldn't come up with much better in the short term for a Visions card myself. Alternate Garruk Wildspeaker (you can make a new planeswalker it doesn't have to be Garruk). Up: I can see the reference to Crystal Spray, but the design falls short. 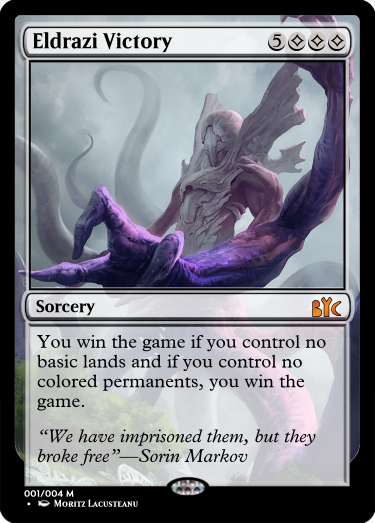 It’s a land that doesn’t make mana, and has the extra drawback of preventing future card draw. I would make the ability cost mana and get rid of the card draw part. : Create a 3/3 colorless Golem artifact creature token. : Draw a card for each artifact you control. UP: Simple but effective is my favorite thing about classic Garruk and I feel like you've captured that perfectly here. You can't gain life and creatures you control can't attack. Prevent all combat damage that would be dealt to you. Frozen in sleep, or frozen in time? 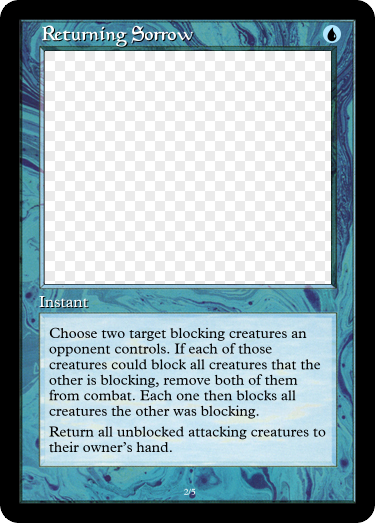 I figured that if I was going to have to give the card a color, I might as well tweak the type to match that color as well. Up: Stopping life gain as an alternative to the cumulative upkeep makes the card way more playable, while still providing a suitable drawback. The affect also works really well as an enchantment, so good choice there. : Until end of turn, equipped creature becomes a Dragon, gets +5/+3, and gains flying and trample. A powerful soul never truly dies. It just finds a new host. Up (Dragonsoul Amulet): I think it's great no modifications from me. EDIT: Good call ZephyrPhantom made edited version. 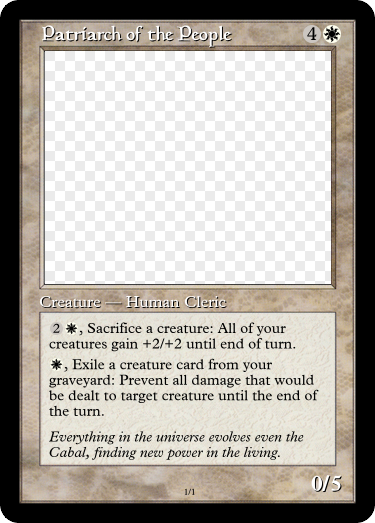 UP: Cool concept, though your base oozes are missing their (presumbably 1/1) P/T and that sacrifice wording probably needs a few "If you do"s or "you may"s here and there. 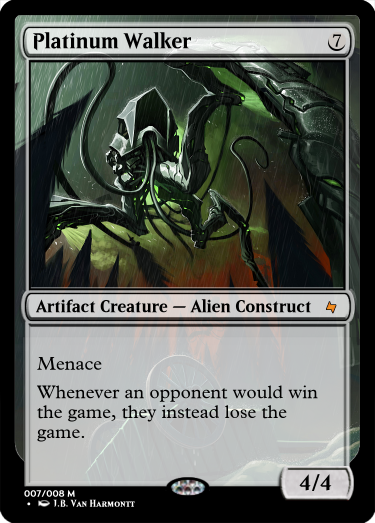 Exile target creature. That creature’s controller creates a 0/1 green Sheep creature token. 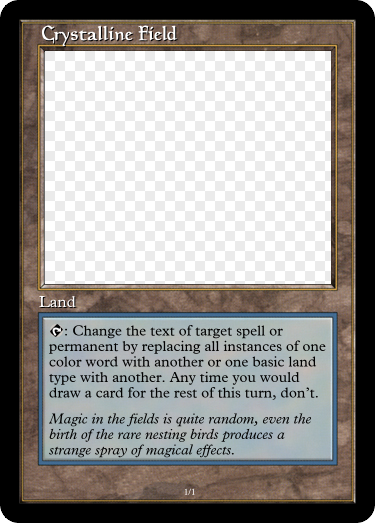 Up: I think Bring to Pasture is too efficient, even for a 2-color card, but the ovinization (that’s probably not a word) is very clear. At the beginning of your upkeep, create a 2/2 green Wolf creature token. Then, if Master of the Pack championed a creature, Wolves you control gain deathtouch until end of turn. Up: Wren's Run Alpha, took me a while to get my head around the deathtouch ability (I'm not used to reading text entries and I kept wanting to make it a second line instead of part of the token creation ability). Looks good I like that the Alpha takes over the pack in the future. I'm making a full cycle, but then I had a deck that won more than one casual game using Sorrow's Path (with Furnace of Rath and Mogg Maniac, admittedly there were better card drops in the deck but I delighted in killing people with "one of the worst cards in the game"). EDIT: good call Jartis, fixed that. Up: What a way to show off the new Planeshift. My only problem is with Fog of Sorrow. I assume the second ability should read "their controller's next turn"? As written, they can just never attack again, unless they somehow attack on someone else's turn. Thought about doing a land for this one (the history buffs among you might guess why), but after finding that quote from King Solomon's actual successor, I couldn't not make him into a card. I think you see why. UP: My first thought was "What? Just a tap and BOOM!?" then I realized it was a 5CMC, very color restricted, and on a tiny body to boot. It's an interesting thought for design space, given how many people find the issue of these sorts of effects on a DTR card. Up: A zero mana 10 damage spell in the wrong hands, I'd say. RDW would probably try and force this into its decks for the sheer value alone - consider taking notes from Chancellor of the Dross and instead having the first effect be a small lifeloss effect, and the second making the opponent lose 10 life. Whenever an opponent would win the game, they instead lose the game. One of these days I'd like to do a War of the Worlds themed set. Next: Planeshift Mountain, nah, just kidding. Planeshift Personal Sanctuary. Up: Very cool. Similar to the Angel but feels very different. Does it work if they try to win by killing you? During your turn, players can’t gain life, and damage can’t be prevented. Up: (Mountain Sanctuary) Nice, although I would probably remove the life gain prevention as it not only doesn't match the original card but is redundant if prevented only during your turn (most dangerous life gain is sorcery speed). Next: Mental exercise futureshift Exhume, or if you really can't come up with that then Timeshift it. Up: Interesting card, I could see some interesting shenanigans that could be used to cause quite a bit of travel. Whenever you play a card named "Exhume,"